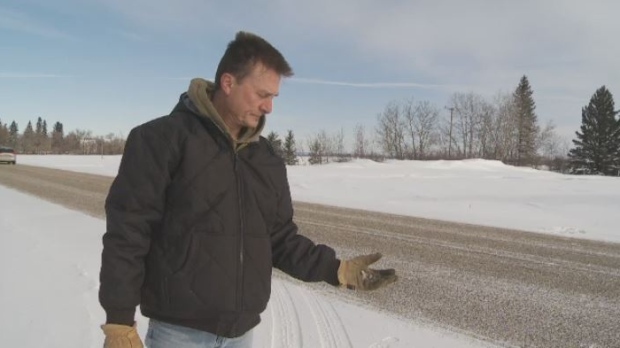 Residents in Wroxton and Kamsack are upset over the state of Highway 8. Dave Tetoff has had to replace his windshield twice since December. He lives on Highway 8, between Wroxton and Kamsack, and says it’s because the highway can’t handle the traffic. In December his windshield was chipped and, as a mechanic, he replaced it himself. The new windshield didn’t last a month before it too was chipped. Although he conducts his own repairs, he says that the cost of the new glass adds up. Before that Tetoff 2016 was the last time he had a chipped windshield. When he brought a claim to SGI it was rejected. He doesn’t expect to have his new claims covered. Tetoff says the problem is that Highway 8 has doesn’t have pavement but sand screenings, which contain small stones. The highway was re-done last summer with the screenings. Ministry of Highways and Infrastructure spokesperson Steve Shaheen acknowledged the concerns about chipped windshields and said that the project is under warranty. “We’ve had discussions with the contractor who did the construction last summer [in order] to come up with a plan for repairs,” he said. But the contractor’s general manager, Allan Barilla of Morsky Construction Ltd., says he is hasn’t been contacted. “I don’t know anything about anything being repaired,” he said. Shaheen advised drivers on Highway 8 to slow down and noted that there are loose stone signs on the highway.